If your oven heats up to only 300 degrees and your linoleum floor is peeling at the edges, it’s a good bet that your kitchen is long overdue for a renovation. But how much does a kitchen remodel cost? According to Remodeling magazine, the average price of a minor kitchen renovation is $20,122, while a major overhaul will drain $60,000 from your bank account. Here’s more of what you can expect to pay—and, even more important, some ways to save. Is Your New Kitchen Sink Totally in the Wrong Place? $8,000 to $15,000: Replacing existing appliances, refinishing existing cabinet doors, and resurfacing existing countertops. $25,000 to $50,000: Demolishing the kitchen but keeping main appliance and plumbing fixtures in the same location. Then adding new cabinets, appliances, countertops, flooring, lighting, and plumbing fixtures. $50,000 to $100,000: Same as above while also reconfiguring the appliance and plumbing fixtures as well as electrical and HVAC. A renovation this size usually means opening up the kitchen to include an eating area. An unwritten home improvement rule is to spend 5% to 15% of your home’s total value on updating your kitchen. But that doesn’t mean you can’t use your ingenuity to save more than a couple of dollars. Face-lift vs. gut renovation: Avoid replacing cabinets as even a midrange option can run you $3,500 to $5,500. Face-lifts should be confined to painting cabinets and updating hardware and lighting. Appliance package: Unless you have unlimited funds or are a professional chef, “stick with the basics on appliances,” says Clendenon. “No one needs a six-burner stove.” The difference in your budget could be huge. For a typical kitchen, appliances can run around $6,000, while high-end models could set you back $15,000 and up. 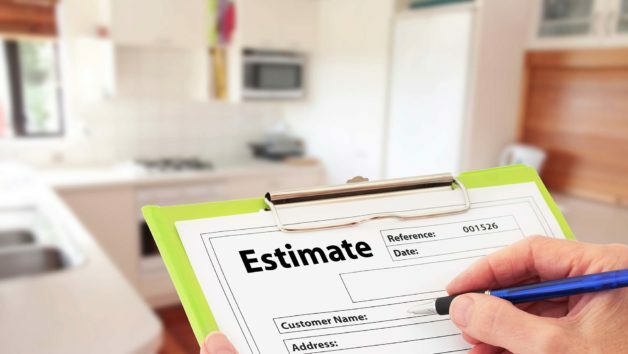 Plan, plan, plan: Poor planning that leads to contractors twiddling their thumbs waiting for something like a sink to arrive will send you over budget. If you’re tempted to splurge anywhere, countertops are a worthwhile investment, because they can radically change “the complexion of the space, improve function, and add value,” says Clendenon. Her go-to is the nonporous Silestone, which comes in multiple color options. Midrange countertops should cost between $2,100 to $4,100. What’s the return on investment on a kitchen remodel? None of these expenses can be considered pocket change, of course. But you will get some of that money back later whenever you decide to sell your home, because buyers will willingly pay for your new look. In fact, you’ll earn back an average of 83% of the money you spend on a minor upgrade, or 65% for a major overhaul. In other words: You’ve got to spend money to make money on a home. And besides, who doesn’t want a brand-new fridge and sleek new countertop?